Consumer Cyclical companies are among the most common dividend payers’ group. This sector tends to thrive in bullish economies as it is fueled by consumer spending. There are great opportunities in this sector if you can time your purchase. Here’s the Consumer Cyclical dividend stocks list. First, I must tell you; I miss my annual trip badly these days! The weather isn’t that nice where I live, and I can only vaguely remember when I was surfing in El Salvador with Amy & William – my 2 oldest children. This is exactly what is happening with consumer cyclical stocks (also called the consumer discretionary sector); they are surfing on easy waves and enjoying the sun. Consumers feel like they are on vacation and they don’t hesitate to spend more on cervezas & vinos a la playa. However, as you may know, the ocean can rapidly shift moods, and the next wave could eat you up. This may happen faster than we expect. As the wind rises rapidly on the coast, headwinds such as interest rates increasing, commercial wars, inflation, debt levels and consumer loss of confidence could rapidly hit the economy and send many sectors to the bottom of the ocean. This article explores consumer cyclical sector, defines how it can possibly boost the yields in your portfolio, and provides you with a complete dividend stock list including comprehensive metrics. What Consumer Cyclical Stocks Can Do For Dividend Investors? Consumer cyclical companies have usually been around for a long time. Those who survive recessions build strong brand recognition, and they operate impressive portfolios of appreciated products or services. This business model often leads to strong cash flow generation. Consumer discretionary stocks will provide investors with both stock appreciation potential on top of solid dividend growth expectations. Do not ignore those lower yielding stocks, and do think about the total return. They could be quite helpful to boost your portfolio performance over the long run. The Consumer Cyclical Dividend Stocks list is being updated on a quarterly basis. 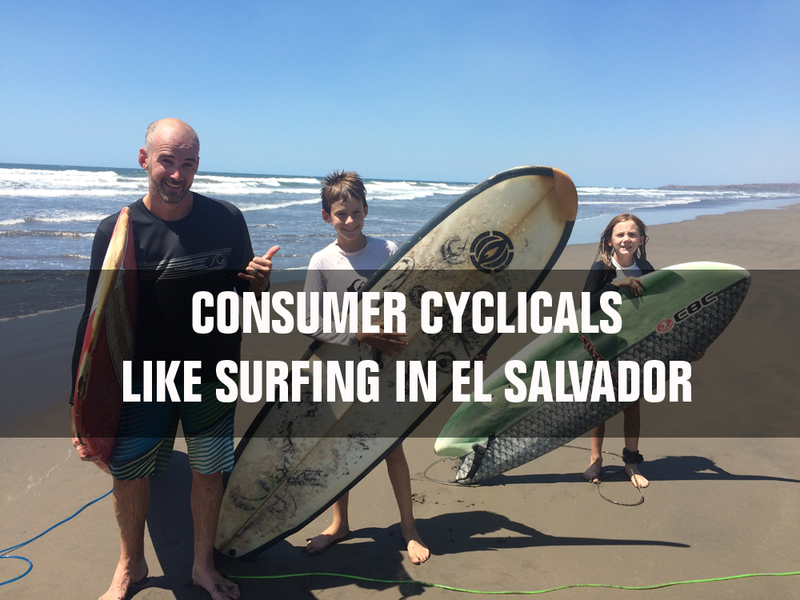 As consumer cyclicals will be among the best surfers to enjoy macro economic tailwinds, they are likely to fall first when panic arises among investors. This panic reaction is usually your chance to pick them up at bargain prices. To keep the surfing analogy, you can picture a bull market as a wave building. You don’t want to pick junk that has been brought up to the top by the high tide. You want to pick only the finest shrimps for your portfolio. This is what we will offer you in this list. We think the best opportunities in this sector are often found among the lowest yielding stocks. Companies showing high single-digit dividend growth to double-digit growth numbers, low payout ratios, but also yield between 1.5% and 2.5%. On the other side, the worst companies of this sector (especially if you are shopping during a bull market) are often higher yield stocks. The reason why there is a handful amount of consumer discretionary companies offering yields over 5% is often because the company is losing steam. The market has lost its confidence in the business getting back on track. Don’t fall for the yield before understanding what is happening in the company’s environment first. Disney is the king of content. In 2006, it bought Marvel for $4 billion. Six years later, Disney sealed another $4 billion deal with the Lucasfilm purchase. Both deals proved Disney’s incredible ability to generate billions of dollars from purchased content. Over the past 5 years, DIS blockbuster movies and theme parks have shown strong potential, and have driven both revenues and earnings up. Now that the company announced it will stream ESPN along with the rest of its content, DIS just may have unlocked another world of opportunities. Canadian Tire is a well-known and loved Canadian retail store. It offers a variety of products throughout several categories (automotive, living, fixing, playing/sporting goods, apparel, and financial services). Besides the various Canadian Tire brand declination, the company also owns Sports Experts, Sportchek and Atmosphere brand under the FGL sports division (21.5% of CTC revenues). Starbucks is one of the recent success stories in the consumer space. Founded in 1971 by the opening of the first coffee shop at the iconic Seattle Pikes Market, it now operates 22,519 stores in 75 countries. Starbucks is known for its stellar customer experience and its variety of beverages. It has built a reputation for listening to its customers and using technology (Facebook, Twitter, mobile payment) to continuously improve its in-store experience. Magna International is more than an international automobile parts supplier; it also designs, develops, manufactures, assembles and engineers a wide variety of automobile parts. Magna sells to OEMs (original equipment manufacturers) across 26 countries. It offers a wide variety of 86 products that go from seating to roofing systems. 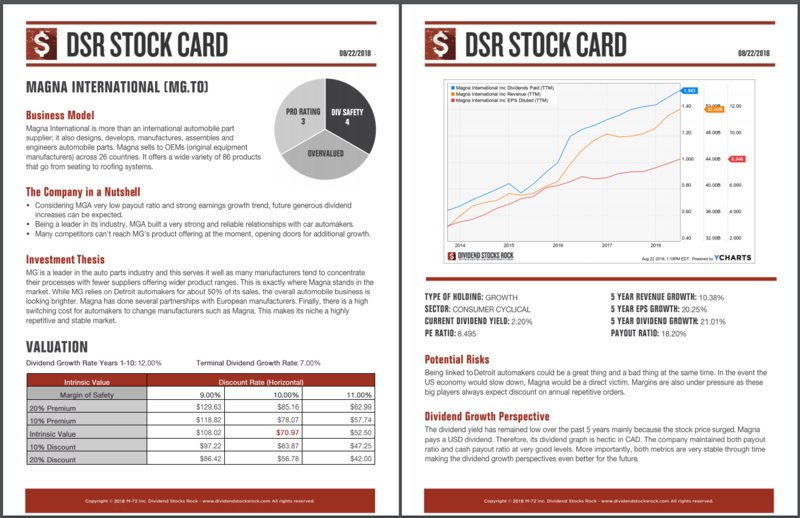 If you liked the Consumer Cyclical dividend stocks list, but you are looking for additional sectors, you can register to our free newsletter and receive an exclusive access to all our sector dividend stock lists. For each industry, we cover both U.S. and Canadian dividend stocks.